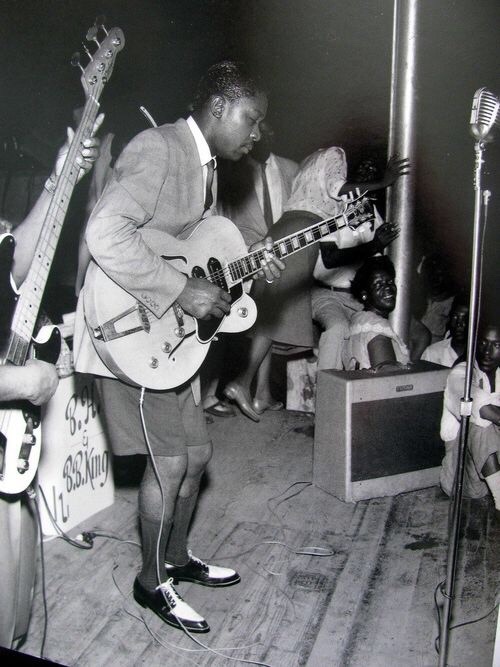 bansheeroars: That’s a three pickup Gibson ES-5 he is playing. They first came out in 1949. This one has to be from between 1949 and 1954, based on the controls. I came across this picture while reading Gibson Electrics – The Classic Years by A.R. Duchossoir over the weekend. timpeter: The bassist is playing a Fender Precision Bass, first introduced in late 1951, so that gives you the earliest possible date of the photo. Also, it looks like the placard on-stage is for “B.H. and B.B. King,” which must be Bill Harvey. Bill Harvey’s band was B.B.’s primary road band from ’52-’56. Very cool photo. And, yes, a very sweet guitar. bansheeroars: Good call on the P-bass. I was too busy looking at the Fender amp on the right side of the pic which didn’t help at all since Fender Amps similar to this were out in the late 40s. I would guess, based on the design of this one that it’s from the early to mid 50s, but maybe someone who knows these amps better than me has a better idea. timpeter: The amp is what’s known as Fender’s “wide panel” style, made from roughly ’53 into ’55. I can’t place the actual model, which is why I didn’t think about when the styles date to, though it’s probably a Super (it might also be a Bandmaster or Pro, but it’s really tough to tell in this picture). So, really, this photo has to be no earlier than late 1952 (when “wide panels” first started appearing), and probably 1953 at the earliest. As for the latest date, I’m sticking with 1956 when B.B. stopped playing with Bill Harvey.